This is NOT just for top athletes. The Swivel Trainer has challenged some of the strongest men out there, but when a 60 y/o woman got down and used it, that was when I realized you don’t have to be a gymnast or bodybuilder to use this. 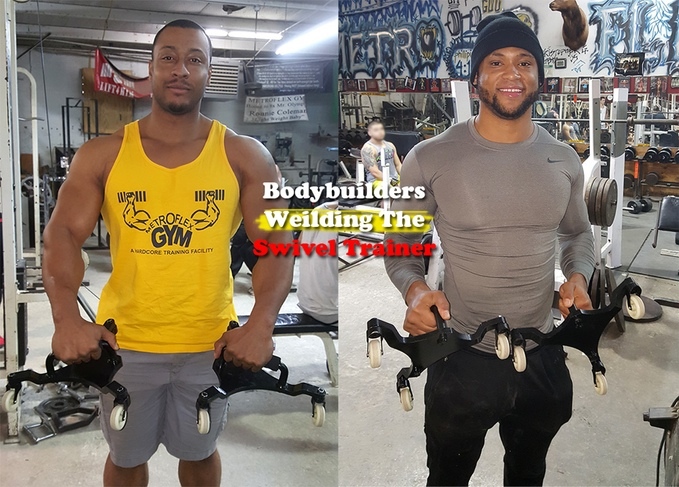 The Swivel Trainer is about strengthening your body regardless of your background or profession. It engages your entire upper body like nothing else on the market… like nothing else in any gym. 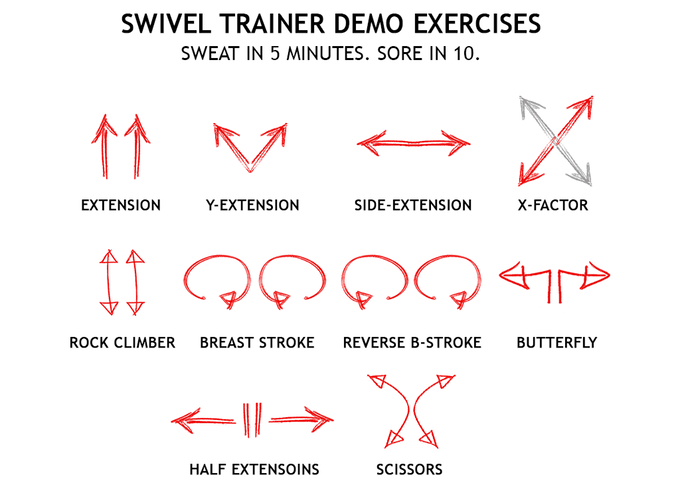 Above are some of the exercises I used to introduce people to the Swivel Trainer. It’s actually quite easy. You’ll be on your knees and hold the handles. The motions above should be consistent with the direction of your hands, while your body is straight and suspended above the ground. There are so many different exercises you can do with the Swivel Trainer, but there are 2 exercises in particular that are the most popular and most effective: 15 Push-up Challenge and the Shredder. The 15 Push-Up Challenge uses a combination of a close-grip and wide-arm position as illustrated below. This may look quite simple in concept, but real-life application has proven over and over again that no matter how fit you are, you will feel the burn by the time you get to 15 push-ups. If you’re not in top shape, you might not even finish 10. It’s that intense. The Shredder is a whole ‘nother animal. In just one position, you are actually able to do 6 different exercises that train specifically just your biceps, triceps, forearms, wrists, abs, obliques, chest, shoulders and/or back. It is the ONLY product on the market (or any existing gym) that allows you to work all these muscles separately and/or simultaneously. That one position is only on one side of the body. Wait until you do the other side. That’s why we call it the “Shredder”. Anyone that places their hands on the Swivel Trainer and tries it will NOT go back to using any other comparable product. It can already replace multiple products on the market today, but some of the exercises you can do with the Swivel Trainer cannot be duplicated by any equipment in ANY gym. This is a fact. I know that’s a very bold claim, but it’s true. It’s been verified in multiple gyms (big and small) and by fitness trainers who have been in the industry many, many years. Just the sight of the “Classic” version will turn heads at local gyms, but it’s not all about looks. It doesn’t matter how strong you think you are, if you use the routine I outline, the Swivel Trainer will train your upper body so intensely and so quickly that you will be sore for a few days with just 10 minutes of using it for the very first time. Don’t be afraid! That’s exactly what it takes for your muscle to develop! So if that’s what you want, you shouldn’t be scared at all. For some folks, they will feel muscles they didn’t know existed. They’ll feel muscles bulging out from places they didn’t know was possible. I know it sounds ridiculous, but it’s one of those things you really must try for yourself to believe it. That is why I’ve taken them to local gyms and had people test it out. 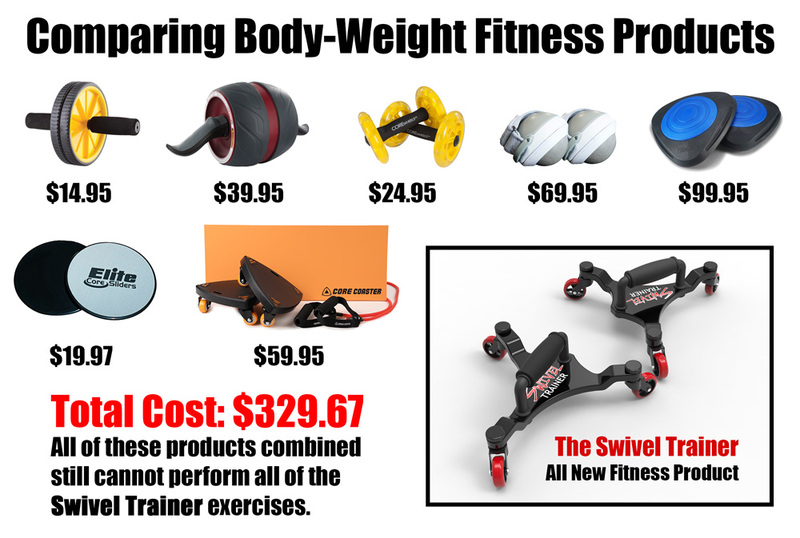 Everyone who has tried the Swivel Trainer is blown away by its low impact, low resistance, but high-intensity training. And these are exercises done only from their knees! If you’re an athlete of any sport, whether recreational or professional, and you need a shortcut to training your upper body, the Swivel Trainer will solve your problems. It doesn’t matter if you’re a runner or play soccer, football, baseball, basketball, rugby, golf and so on, your core and upper body is essential to your success. If you don’t have time to work that part of the body, let Swivel Trainer save you time. CLICK HERE to pre-order a set today!